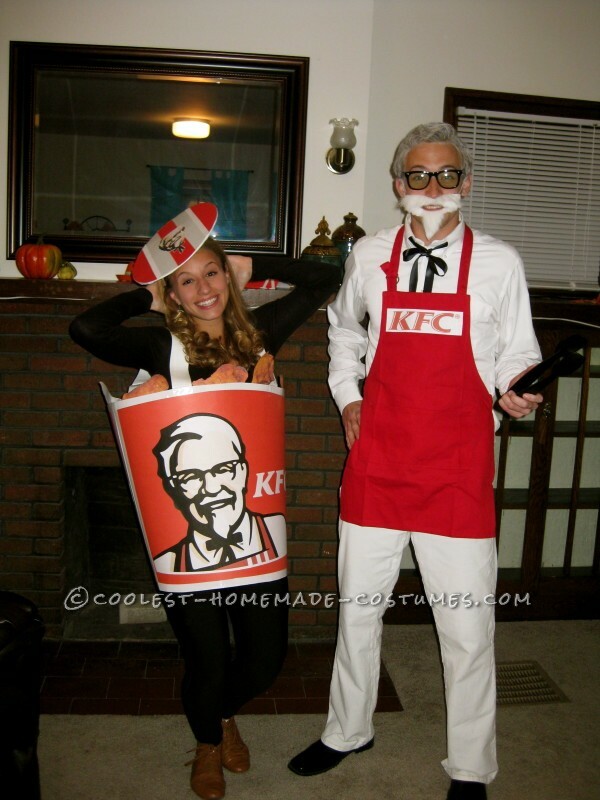 Two years ago, my boyfriend and I went to a college Halloween party as Colonel Sanders and a bucket of KFC Fried Chicken. We wanted to dress as something original that we’ve never seen out at a Halloween party before, something that would bring smiles and laughs to people’s faces, and this costume did just that! It was an added bonus that my boyfriend is actually from Kentucky. When we walked into the party, everyone cracked up and came over to get a closer look at our work. We received compliments all night about how amazing these costumes turned out, and how they were the best at the party! Several people pointed out the clever placement of my fried chicken breasts (which was genuinely unintentional but worked out nicely)! I make a homemade costume every year, but I must say that this was one of my all time favorites. Together, these costumes took about three-four days to make in our spare time between classes and homework. White Dress Shirt: My boyfriend used a white dress shirt that he already owned. Easy! 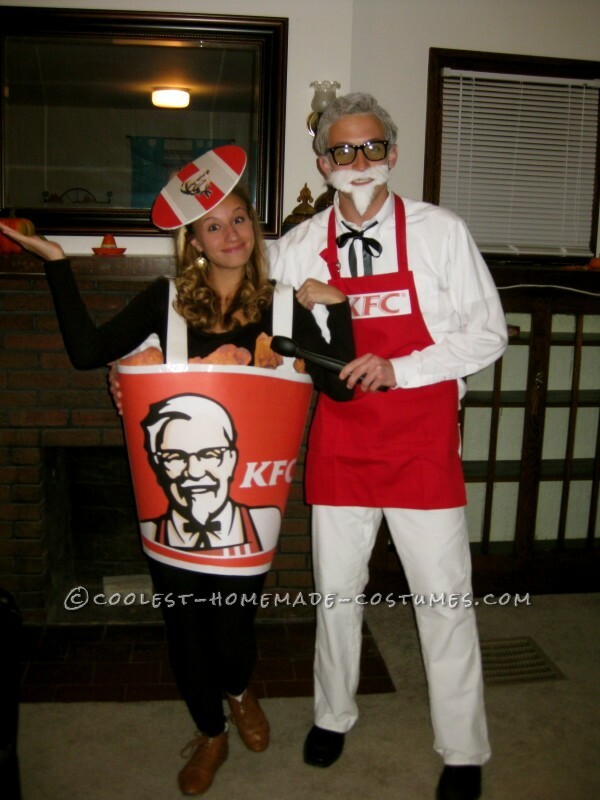 White Pants: We found a pair of white pants at Goodwill for the Colonel Sanders look. Actually, they were women’s pants but nobody could tell the difference. Red Apron: We found a red apron at Walmart. We printed the KFC logo and taped it onto the front of the apron with duct tape so it was extra secure. 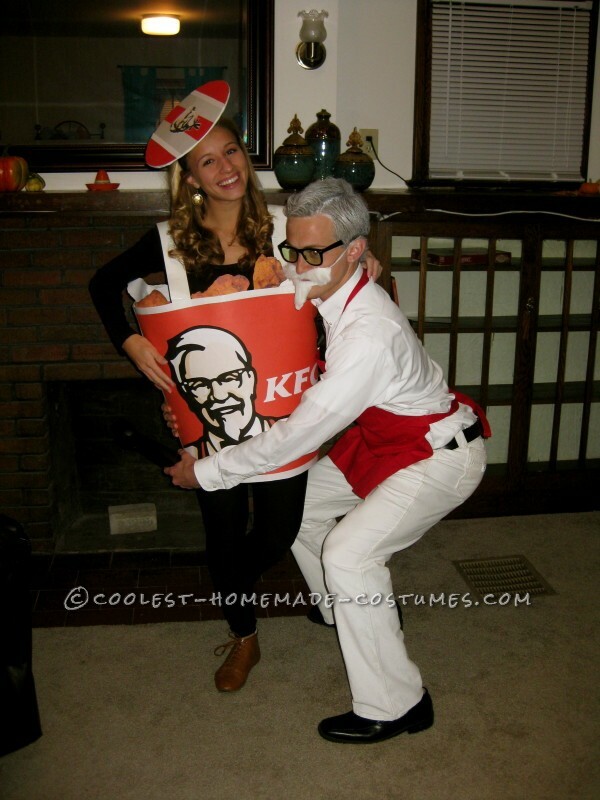 White Hair Spray: He styled his hair like the Colonel and sprayed it white. Glasses: He wore an old pair of non-prescription glasses from a past costume. Kitchen Utensil: He used a pair of kitchen tongs for extra effect in pictures. Two Pieces of Red Poster Board: I shaped the pieces of red poster board into a bucket and taped it together with white duct tape (creating the seam of the bucket). I used 1 ½ – 2 pieces of poster board to create the desired size of the bucket. White Duct Tape: I used white duct tape for detail along the top and bottom edges of the bucket, and to create diagonal stripes on the back of the bucket. I also created a pair of white duct tape suspenders to hold up the bucket. Bucket Logo: To create the bucket logo, I found a picture of the KFC logo online and pasted it into Microsoft Word. I enlarged the image to the desired size (stretched way beyond one page), and I copied/pasted and cropped the photo into four sections (top half left of the photo, bottom half left of the photo, top right half of the photo, bottom half right of the photo) until it spanned four pages perfectly. I printed the four-page logo and matched up all of the seams before pasting it onto the front of the bucket. For the back of the bucket, I printed out “Finger Licking Good” in white font and glued it to the back of the bucket. Bucket Lid and Headband: To create the bucket lid I wore on my head, I cut out a circle from a piece of cardboard, covered it with white and red strips of construction paper, and glued a picture of Colonel Sanders on top. I attached the cardboard ‘lid’ to a headband with duct tape. Fried Chicken Photos: I found pictures of Fried Chicken on Google and enlarged them to desired size. I printed them, cut them out, and taped them along the top edge of my bucket. Black Leggings and Long Sleeve Shirt: I chose to wear all black under my costume so the bucket itself would be the central focus.